On the log screen (www.website-url.com/wp-admin), just click on “Lost your password?” and type your username or your e-mail address. Please note that for security reason, your password will be automatically expired every 30 days. You will need to register a new password to login on the CMS. Media : in this section, you can see all the images and attachments of the website. Pages : in this section you can see all the pages of the websites. You can edit, add and delete pages here. Places : in this section, you can add, edit or delete points of interest on the Google map. Offers : in this section, you can add, edit or delete the offers. Accor Newsletter : in this section, you can see the entries for the newsletter subscriptions. You can download the data by clicking on the “Download” button. FB social : in this section, you can manage the images of the social widget of the homepage. Hotels Options : in this section, you can set some features as the hotel name, the hotel address, the social links but also manage the navigation and the highlighted pages of the homepage. You have more details on each category in this guide. Here, you can switch to another language to see the related content. This button allows you to create a new page / places / offers depending on the category you are in. On the “Page” category, the website main page is marked with the suffix “Front page”. Here, this is a parent page. Here, this is a child page (in this screenshot, the parent page is the “Rooms & Suites” page). Here, you can create or edit the translation of the related page. If you have a lot of pages, you must navigate to see the other items. 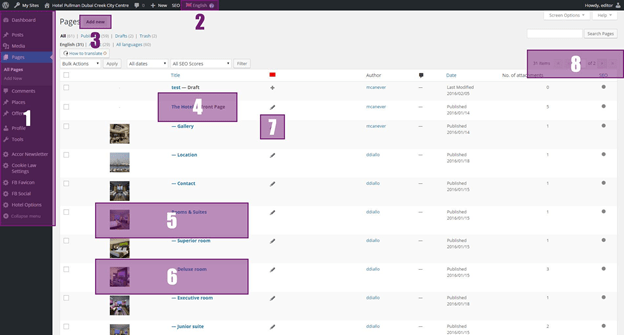 In this section, you can add and edit the additional contents of a page (specific according to the selected template). In this section, you can upload images for the slideshow (only on the homepage). In this section, you can add options on the page/offer (specific according to the selected template ). In this section, you can choose the language of the item and select if you want duplicate uploaded medias and featured image to translations. This section allows you to manage the publication of your page (publish, edit, delete). You can also preview your changes by clicking on the “Preview changes” button. 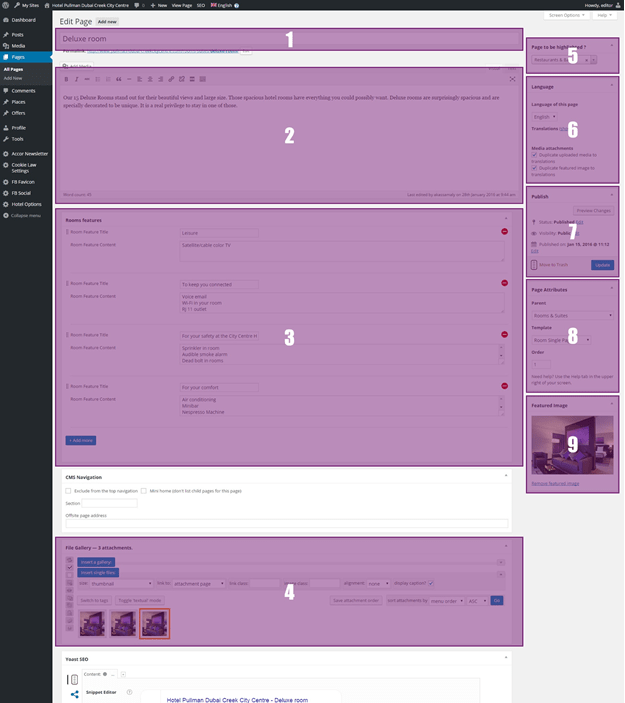 In this section, you can select the parent page and the template page. In this section, you can select the image/illustration on the page/offer. * to see these sections, you need select a template and save before. As on Word, the text editor allows you to format the content. You can bold or italicize your text with the editor. If you are familiar with HTML, you can create/edit the text directly in HTML. For this, just click on the “Text” tab to switch to HTML mode.